This is an exciting time for many of the graduating seniors; the end of an era and the coming of age. It is also a big transition time from old friends and high school to new friends and college dorms. Chasing Treasure has the perfect gifts for your graduating girls with a fabulous selection of new travel jewelry cases. Your graduating girl has a brand new exciting adventure waiting and what an awesome gift a traveling jewelry case would make. 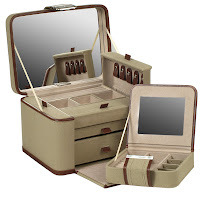 Traveling jewelry cases are available in many different sizes and each offers unique storage features so you will be sure to find the right one. Many of our cases come with a handle and are either crafted in gorgeous leather or beautiful, colorful faux leather. These cases come lined in soft material to protect and cushion her favorite jewelry that will go with her to her new home. The traveling jewelry cases, which are sometimes known as train cases, are crafted with great style and wonderful designs. The cases come in many sizes from wallet styles to lovely fold out cases with ample drawers and pull out mini travel boxes. Any of these are going to make your graduate a very happy girl. We carry many different types, colors and price ranges in our travel jewelry case category and we have new ones arriving on a regular basis too. When it comes to finding the right graduation gift for you graduating senior girl, it will be easy to select the perfect one for her. It will be a gift that she will be thrilled to take along on her upcoming adventure and new life experiences and treasure for a lifetime of memories too. The one pictured is beautiful! That is certainly better than most gifts I've seen. Need Help Choosing the Right Graduation Gift?